On Wednesday's edition of Treatmant, the Helpers discuss more rookie running backs and their fantasy situations. Jay Ajayi, Tevin Coleman, Duke Johnson, David Cobb. Well, that escalated quickly. That's about all I can say about Ajayi's knee issues. There were reports that it was bad, there were reports that it wasn't that bad, and then we saw what it amounted to come draft day. It was Ajayi getting drafted in the fifth round. The fifth round of all places. It was clear this wasn't an Eddy Lacy situation, where there was some hesitance but the team that chose him (Green Bay) but ultimately decided to risk it. This was different. Teams were afraid of this guy. 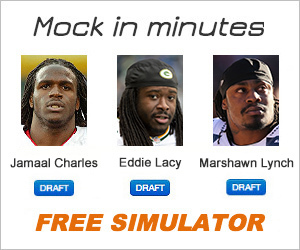 Eddie Lacy was drafted in the second round, pick No. 61 overall. Several running backs went before him. This almost seems like a 'whatever' pick at this point. I've been high on Ajayi since I studied him a bit on film. Liked his running style, his receiving ability and his love for creating contact. He comes to a Dolphins team with a crowded backfield. You have Lamar Miller, Damien Williams and LaMichael James there. The Dolphins may have found their true workhorse back in Lamar Miller, after he turned in a solid season last year with 1,099 yards. Back when they had Reggie Bush and Daniel Thomas. The Dolphins upgraded their offensive line last season bringing in Branden Albert. Bill Lazor has also worked with Chip Kelly and infused some of his principles into his own offense. Mainly the uptempo style, which is I think we saw some big plays drawn up for Mike Wallace in the beginning of last season and it paid off in the touchdown category. Still, it's highly unlikely Miller (at just 24 years of age) takes a backseat after the kind of season he had last year. The Dolphins are a team that has flirted with the playoffs before. There's a lot to like with Coleman. He runs fast in the open field. 4.4 speed. He's listed at 6'1 but he's always been charted at 5'11. I never know truly how tall some of these running backs are. Anyway, he goes to a team in the Falcons who have a lot of questions in the run game with the departure of Steven Jackson and the slow start of Devonta Freeman, a rookie last season. This is a pass-heavy offense, and Coleman wasn't asked to do a whole lot of that in Indiana. Caught 25 passes for 141 yards in his Senior season. This is a home run hitter type of running back. He'll have days where he rushes for 150 yards on seven carries and have a 70-yard touchdown. He comes into a situation where Kyle Shanahan's zone-blocking scheme might not work for him, as it requires a lot of cutting and quick change of direction. We saw Darren McFadden struggle in the same kind of offense with Oakland. I liken Coleman to that same kind of runner. He will probably not flourish is this kind of scheme. He will need big holes and that just won't translate to his style of running. Not saying he can't be an effective zone runner. It just doesn't play to his strengths. The Hoosiers did run some zone blocking plays and Coleman is good at reading his blocks. I'd just be surprised if he makes an immediate impact in his first season with Atlanta. Of all teams I thought of selecting Johnson, the Browns were definitely not one of them. They seemed more like a power running team, and Johnson is a playmaker with gifted vision, receiving and return abilities. Not knocking the pick, just didn't see it coming. It also pains me because he's such a gifted receiver and he's going to be catching passes from arguably the worst quarterback tandem in the league. You got Johnny Manziel and Josh McCown throwing him passes. It's going to be difficult to see that working out well. Only two games of over 300 yards last season, the one nice thing is the Browns will probably be down a lot so maybe McCown will have to throw more. Still, that doesn''t really play to his strengths. And we know Manziel is a work in progress and he really lived up to every knock people had of him coming out of Texas A&M. I'm not going to get into all his off the field issues but this Browns looks bad. Like really bad. No receiver depth, just added Dwayne Bowe from Kansas City. There are some plus signs. The Browns are looking to run the ball a lot. They had two backs last season combine for over 1,000 yards rushing. They also have one of the better offensive lines in the league and went out and added depth with their selection of Cameron Erving on Day 1. I always like when teams build from the inside out.